Building on the heritage of the industry standard BM series of near-field monitors, LYD-7 is completely refreshed and updated with the latest DSP and amplifier technology. With the additional driver size over the 5" model, bass response is extended. Perfect for medium size spaces, home studios and edit suites, LYD-7 offers producers and musicians an authoritative and powerful studio monitor that still excels at low mix volume, while still maintaining the precision Dynaudio PRO is famous for. The Dynaudio Pro LYD-7 is totally invigorated and upgraded with the most recent DSP and amplifier hardware, furthering the legacy of the industry standard BM series of near-field monitors. The LYD-7 delivers producers and musicians an imposing and mighty studio monitor that doesn’t falter at low volume, all the while still retaining the precision Dynaudio Pro is famous for. It’s well suited to smaller spaces, home studios and edit suites. Each LYD-7 drive unit contains a 96kHz/24bit signal path as part of its bi-powered (50w HF/50w LF) cutting edge Class-D amplifier. The user also has the potential to extend or curtail the low frequency response by 10Hz where necessary with a DSP, if used in the correct manner. The 'Position' and 'Sound Balance' controls guarantee the ultimate possible performance for any mixing or listening environment. The LYD-7 replicates upper frequencies in an organic uncoloured manner thanks to Dynaudio's legendary handcrafted soft-dome silk tweeter with an aluminium voice coil. These tweeters also don’t produce a drop of the shrill high-frequency resonance that other designs are typically plague by. This makes it a pleasure instead of a chore to work long hours, avoiding ear-fatigue. 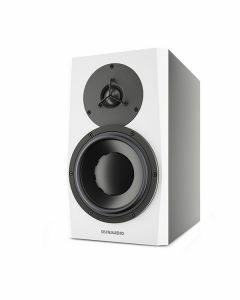 For the lower frequencies, a trademark handcrafted Dynaudio 7" woofer is constructed from Magnesium Silicate Polymer (MSP), providing the optimum equilibrium between stiffness, weight and dampening. The overall sonic performance is bettered, with less thermal distortion, when combined with the improved thermal behaviour of aluminium in itself and the die-cast aluminium basket of the LF driver. Making use of lightweight aluminium instead of copper permits a larger diameter voice coil. The end result is increased cooling and the potential for the flat cone design to give off better axis frequency response. This means transient response is supremely fast.